In a large bowl, using a fork, stir together the all-purpose flour, cake flour, sugar, lemon zest and salt. Using your fingertips, work in the butter until the dough resembles coarse meal. Make a well in the center and add the whole egg. Gently blend the ingredients with a fork to form a soft dough. Gather the dough into a ball and flatten it into a disk. Wrap the disk in plastic and refrigerate until firm, at least 1 hour or overnight. Preheat the oven to 350°. Using a knife, cut two-thirds of the dough from the disk; wrap the rest in plastic and refrigerate. Roll out the dough between 2 large sheets of wax paper to a 10-inch round about 1/8 inch thick; refrigerate the dough until chilled but pliable, about 5 minutes. Peel off the wax paper and fit the dough into a 9-inch tart pan with a removable bottom. Patch any weak spots and refrigerate the shell. Roll out the remaining dough between sheets of wax paper into a 9-by-6-inch rectangle about 1/8 inch thick. Refrigerate until chilled. 3.Spoon the jam into the tart shell and spread it evenly. Cut the dough rectangle lengthwise into 12 strips. 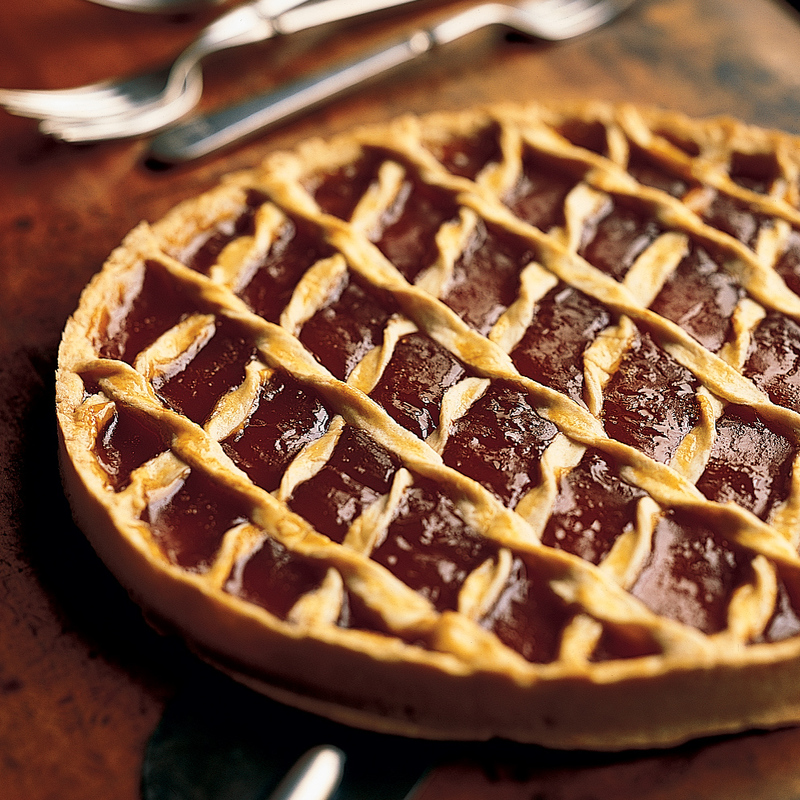 Arrange half of the strips across the tart; for a decorative look, twist the strips first. (Discard the wax paper.) Working in the opposite direction, repeat with the remaining strips to form a lattice. Brush the lattice with the egg yolk wash. Bake the tart on the bottom rack of the oven for 30 minutes, or until the crust is golden brown and crisp. Serve at room temperature. The dough can be well wrapped and frozen for up to 1 month.